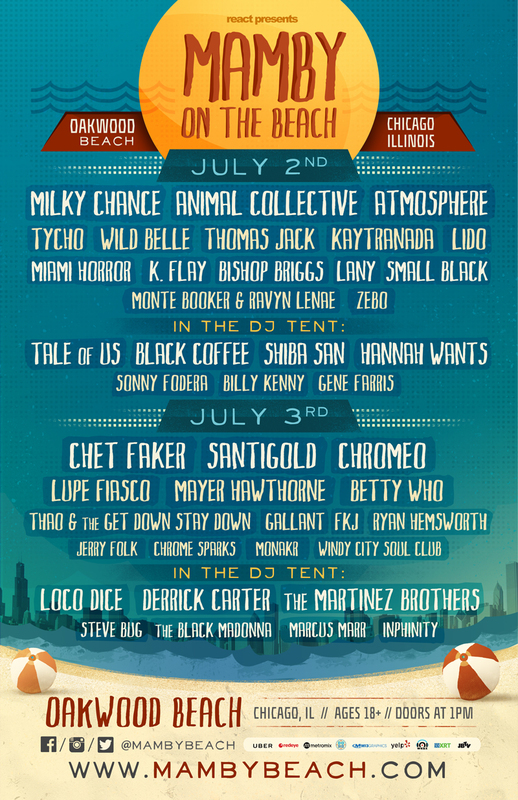 Chicago’s premiere beachside festival, Mamby On The Beach, is returning to the Windy City this year, and the lineup rivals even last year’s! Hitting the stage at Mamby in 2016 will be Lupe Fiasco, Milky Chance, Animal Collective, Chromeo, Santigold, Chet Faker and many more. Mamby is set to take place on July 2nd and 3rd at Chicago’s Oakwood Beach, and if you were there last year, you know it’s an amazing location for a music festival, so enter our contest now! Winning is easy, enter at the link below and by following The Early Registration on social media, by sharing the contest with your friends, you gain entries that increase your chances of winning! Contest ends June 12th. But why leave things to chance? Buy your tickets here before they sell out! Make sure you also enter our Spring Awakening Giveaway here! It’s easy to win! In promotion of our new Facebook page (as well as our Twitter page), the more you follow us and the sponsors on social media, as well as sharing the contest you acquire points that increase your chances of winning. You MUST follow us on Twitter and Facebook to win. Make sure you do the above at the link in our post and good luck! Contest ends June 12th. Winner will receive (1) pair of tickets/wristbands to Mamby On The Beach. Tickets are not transferable and you may need to present yourself (with a photo ID) to redeem your prize. Winner must be available for the event. Winner will be notified on the day the contest ends, and if he/she cannot be contacted in a reasonable time, a new winner will be selected.